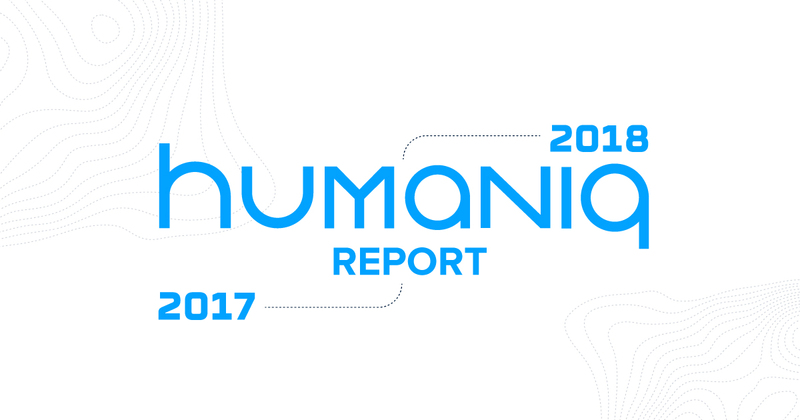 London, October 29, 2018 – Humaniq, the global provider of next-generation financial services, chosen by TechCrunch as a TOP Pick 2018 in Blockchain, is setting its sights high after the achievements outlined in its new annual report. Humaniq, a Blockchain-based platform that provides easy-to-use financial services in emerging economies, has laid out its App’s success in achieving more than 500,000 registered users, sending more than 60 million messages, in 46 countries in just a year. Humaniq’s CEO and founder, Alex Fork, prepared a statement summarising the company’s journey, mentioning the challenges of building a Blockchain and biometrics-based product, requiring pioneering development, and seeking to contribute to bridging a centuries-old gap between the developed and developing world. Yet despite all of the challenges, the company has succeeded in overcoming them and building an established product, the FinTech firm’s annual report says. It all started a year and a half ago when Humaniq received contributions of over $5.2 million from its community in the ICO, allowing it to start its journey. Soon after, November 2017, the Humaniq team officially released the Humaniq App which initially was only available in five African countries, comprising barebones features. Advancing the App, the Humaniq team next implemented the first working Hybrid Blockchain and Biometric Identification system, granting secure access to the system for people without identification documents through face recognition based on more than 50 parameters. Overcoming the many challenges the team faced — such as complicated development requirements, a highly varied legal landscape, and a hard to penetrate market — Humaniq has achieved more than 500,000 registered users in 46 countries, 3 languages for the interface, more than 60 million messages sent by users and more than 1.4m 300,000 transactions implemented within the chats, 28 ambassadors and 13 business partners. Humaniq has developed a significant codebase of its own, extending across 190+ repositories in GitHub, containing 170+ Mb of pure application code on GoLang, Python, and Java, and running to many gigabytes in size overall. Currently, about 50 microservices compose Humaniq’s backend to provide a scalable solution. At present, the Humaniq App contains many features developed specifically to provide the users with all the tools they need to improve their lives: fully-fledged chats with direct payment features, internal support channels and AI help bots, Business Chats for selling goods, an educational channel within the App and LocalHumaniqs P2P exchange. Aside from technical achievements, Humaniq remains focused on raising awareness of financial services and introducing FinTech innovation to the African region, aiming to empower the continent’s populace. Earlier, it ran a global challenge where social entrepreneurs were invited to submit proposals for Blockchain startups that aim to introduce new financial services in Africa. Its social awareness campaigns have included a widely-viewed documentary highlighting the plight of Africa’s unbanked. Humaniq also directly engages local entrepreneurs through its extensive network of African ambassadors. The startup’s efforts did not go unnoticed by the market community. Humaniq was featured in a new landmark report Developing World Financial Inclusion Industry Landscape Overview / 2018 Q2 as one of the most promising FinTech projects. The startup was further mentioned as a leading Bio-identification and Financial Inclusion case in another report entitled Blockchain in UK / Industry Landscape Overview 2018, presented at Parliament and produced in coordination with the All Party Parliamentary Group (APPG) on Blockchain, which analysed the entire UK-based blockchain industry in order to identify emerging trends and leading players. Moreover, Humaniq was recently commended for its efforts to create a next-generation financial services app by tech reporting powerhouse TechCrunch, which selected it as a Top Pick at Disrupt San Francisco 2018. Lastly, the Blockchain-for-Good startup won the 2018 BlockAwards in the category of Community Award: Blockchain & Economy. “As one might expect from a business seeking to bring real change, the path we took wasn’t easy. Launching a new product is always a long shot, as one can never really know how it will be received, and this is especially true in the case of Humaniq App. I’m proud to say that our strategy has paid off, and we are succeeding in overcoming all the hurdles in development and the marketplace. I believe that anyone would find the results we have achieved in a short period of time to be quite impressive.”- said Alex Fork, Founder of Humaniq. Humaniq is a global Fintech company providing next-generation financial services in emerging economies. Humaniq focuses on worldwide financial inclusion by enabling businesses to reach people in emerging markets. The company’s novel financial solutions for end users based on cutting-edge proprietary mobile and Biometric Identification technologies reduce fraud and make it possible and simple for customers to use them from scratch. In 2018 Humaniq was chosen by TechCrunch as a TOP startup 2018 in Blockchain, won “Best in Community Award: Blockchain & Economy” at BlockWorld 2018; and marked as one of the most promising startups fighting for Financial Inclusion in two industry analytical reports, one of which was prepared for an All-Party UK Parliament board. Headquartered in London, Humaniq has over 85 team members around the globe.